Description: Men's Grey Timberland Crew Neck T-shirt with Navy outline logo text. Description: Men's Reebok PD Stripe Polo Shirt. Description: Women's Reebok 'DMX Ride Comfort 3.0' Trainers. Features the Reebok logo on the front tongue and sides. Strong yet comfortable. Ideal as a trekking/walking shoe. Description: Women’s Reebok ‘El Jersey’ short. Features a Reebok logo on the front, as well as two side pockets an elastic waist. Description: Men's Reebok 'Community Hoody'. Features the Crossfit logo on the front, as well as having a large graphic design on the back. Description: Women’s Puma ‘Essential’ padded jacket. Features a Puma logo embroidered on the front chest and side sleeve, as well as two front pockets. Description: Women's Adidas 'Neo Eskimo' boots. Features the Adidas three-stripes on trhe back heel, as well as having a suede upper. Also has fur lined interior and exterior around the ankles. Comes with a spare set of brown laces to alternate the style. 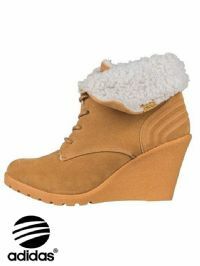 Description: Women’s Adidas ‘Neo Chill’ wedge boot. Features an Adidas Neo logo on the front tongue, as well as three stripes across the back. 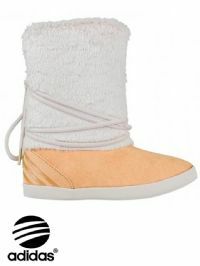 Also includes a front lace fastening fleece lined interior and wedge heel. 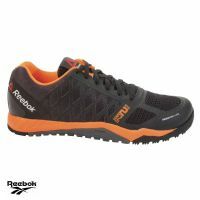 Description: Adult's Reebok 'NPC II EL' Trainers. Features the Reebok logo on the front tongue and back heel. Also has a full leather exterior. 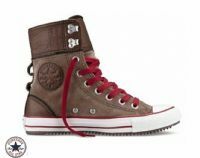 Description: Junior Converse 'Storm Jumper Hi' boot. Features a Converse logo on the inner side, as well as pull string lace fastening and waterproof rubber leather exterior using Counter Climate Technology for winter. Also has a Lace Lock toggle, so no need to tie laces. Description: Women’s Reebok ‘Workout’ pant. Features a Reebok logo on the waist, as well a skinny fit upper and boot cut bottom. 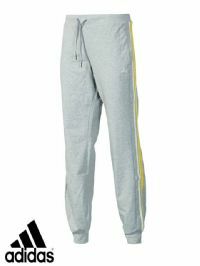 Description: Women’s Adidas ‘Ess 3S’ yoga pant. Features an Adidas logo on the front, as well as two side pockets. Also includes three stripes down each side and made using ‘ClimaLite Cotton’. Please note this particular product has a slit inside label (B grade) and as such may have some minor imperfections. However this has been deemed sellable by Adidas. 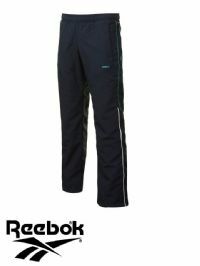 Description: Women's Reebok woven track pant. Features a small Reebok logo on the front upper leg, as well as well as a contrast green and white stripe down each leg. Also includes contrast green pull strings as well as two side pockets. Description: Women's Reebok 'Vib Statem' skirt/short. Features a small Reebok logo on the front, as well as an interior short. Made using 'PlayDry' fabric. Description: Women's Umbro England shorts. Features the Umbro and England logo on the front. Official licensed England product. Description: Women's Adidas Navy Basketball shorts. Features the Adidas logo on the front and also has an inner lycra based shorts. Description: Adult's Babolat 'Shadow Team' Tennis Trainers. Features the Babolat logo on the front tongue and sides. Also has a 'Michelin' Rubber sole. Description: Adult’s Asics ‘Gel-Fit Nova’ trainer. Features an Asics logo on the front tongue and across each side. Also includes a front lace fastening and a mesh exterior. Description: Men’s Adidas ‘Iconic Woven’ jacket. Features an Adidas logo on the front and two side zip pockets. Also has three-stripes on the sleeves, as well as having internal mesh layer. 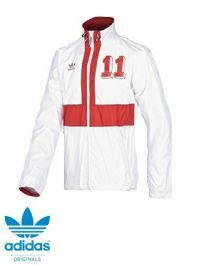 Description: Men's Adidas Originals 'England' track jacket. Features a small Adidas Originals Trefoil logo on one side of the chest, and the number 11 on the other side. Also includes two front zip pockets and 'England' printed on the back, as well as a netted interior. Description: Boy's Nike COR72Z Navy Track Pants. 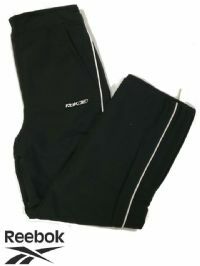 Description: Kid's Black Reebok Woven Track Pants. Description: Women's Navy / Blue / White ZX Flux ADV Verve Trainers.